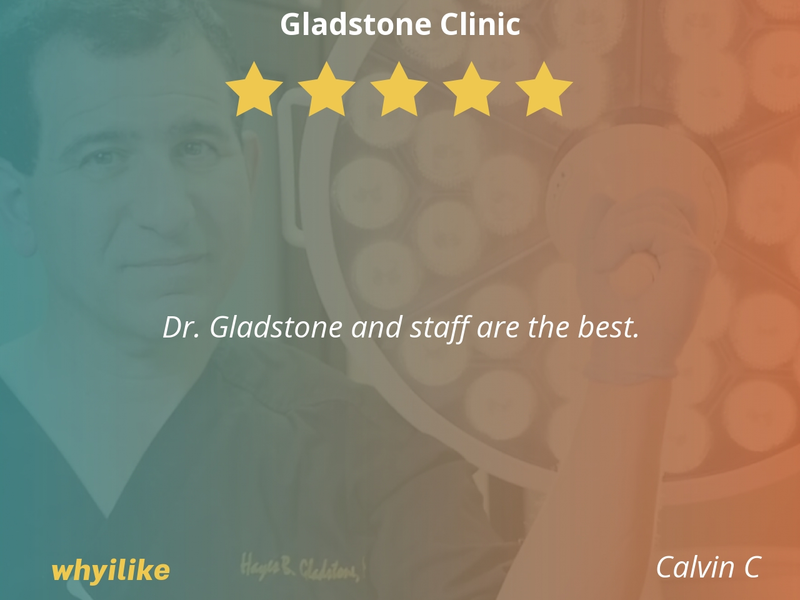 Gladstone Clinic is a full service medical spa and skin care clinic offering CoolSculpting, Cosmetic Surgery, Skin Cancer Screening and Hair Restoration in San Ramon, California. Great service overall. 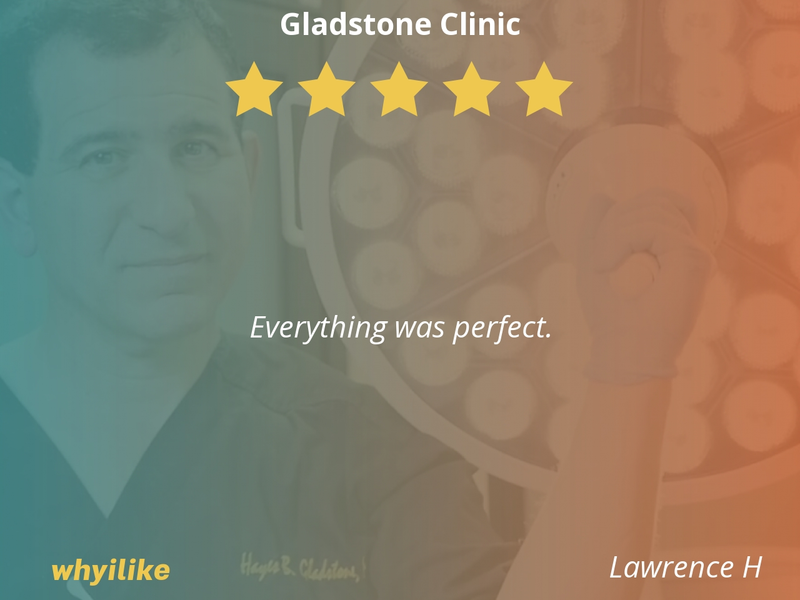 Dr. Gladstone patiently explains what would be better for you. No pushing. I trust him. 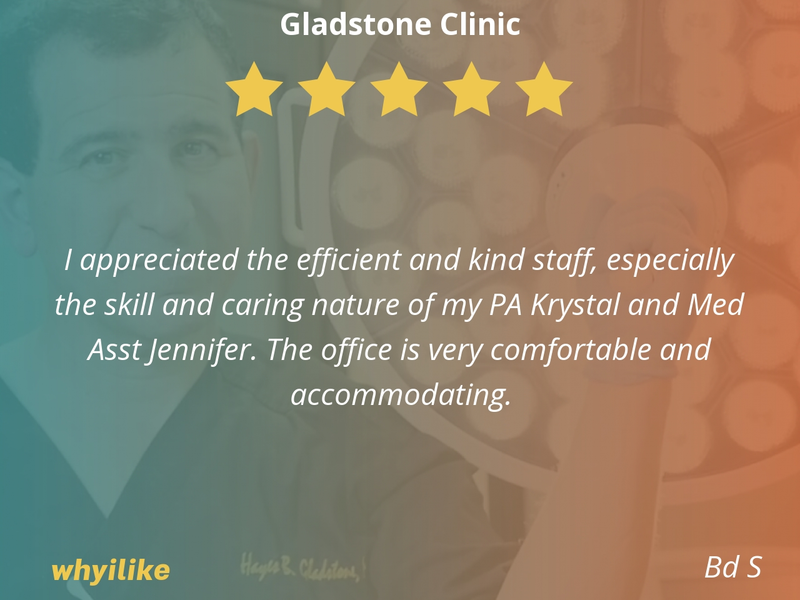 I appreciated the efficient and kind staff, especially the skill and caring nature of my PA Krystal and Med Asst Jennifer. The office is very comfortable and accommodating. 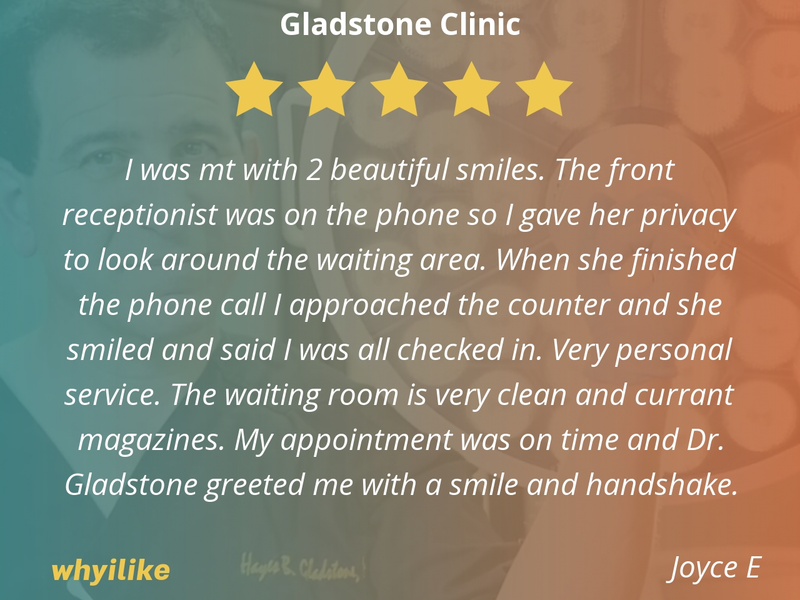 Crystal and staff were a pleasure to work with! I look forward to coming back next year for my annual exam! 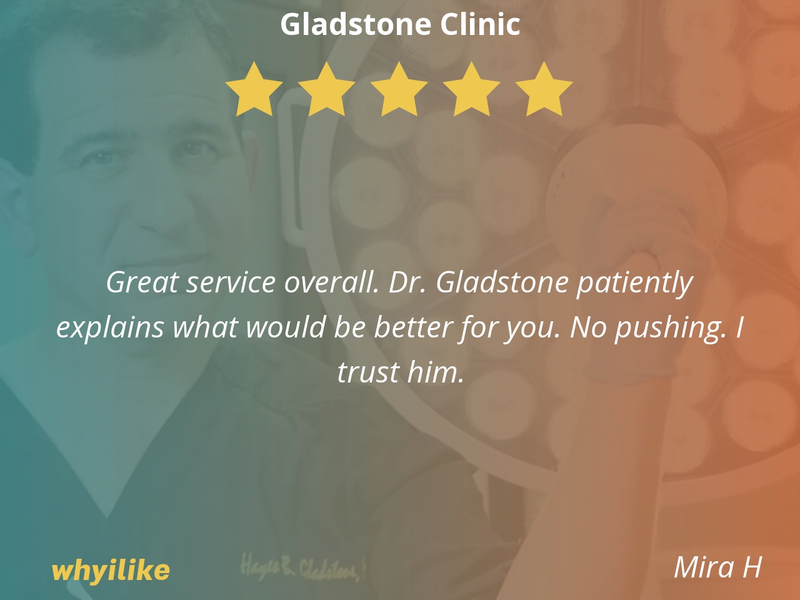 Dr. Gladstone is very honest. One of the many reasons I keep coming back. Their staff is very friendly and has great customer service. In my books he should have 10 stars! I have a very high regard for Dr. Gladstone. The staff and Dr. Gladstone are very professional, knowledgeable and friendly. 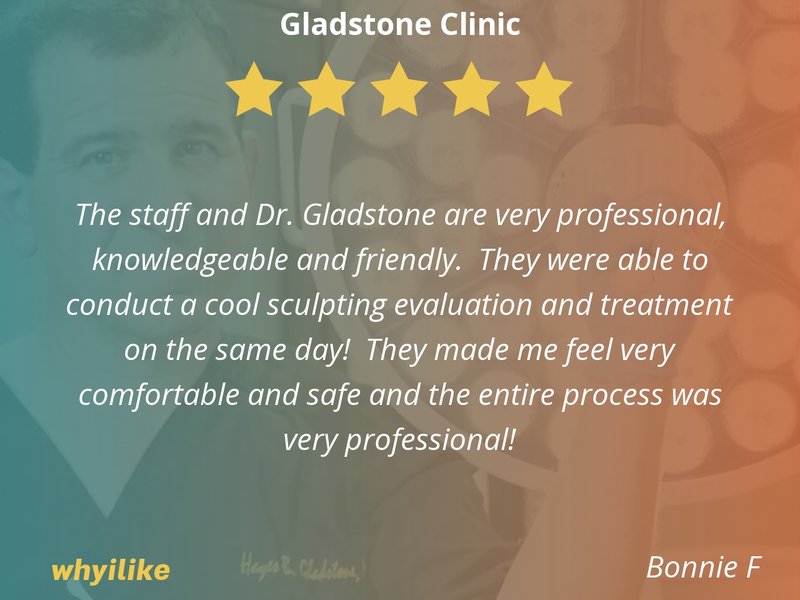 They were able to conduct a cool sculpting evaluation and treatment on the same day! They made me feel very comfortable and safe and the entire process was very professional! I was greeted with a smile and taken to an exam room within 15 mins of arrival. 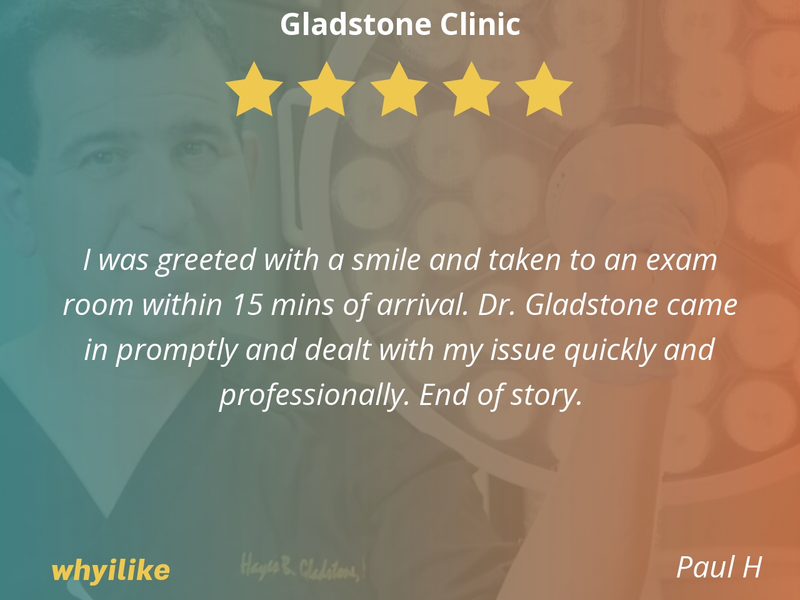 Dr. Gladstone came in promptly and dealt with my issue quickly and professionally. End of story. As is customary, the staff treats me with dignity and ensure that I am escorted to a treatment room soon after my arrival. 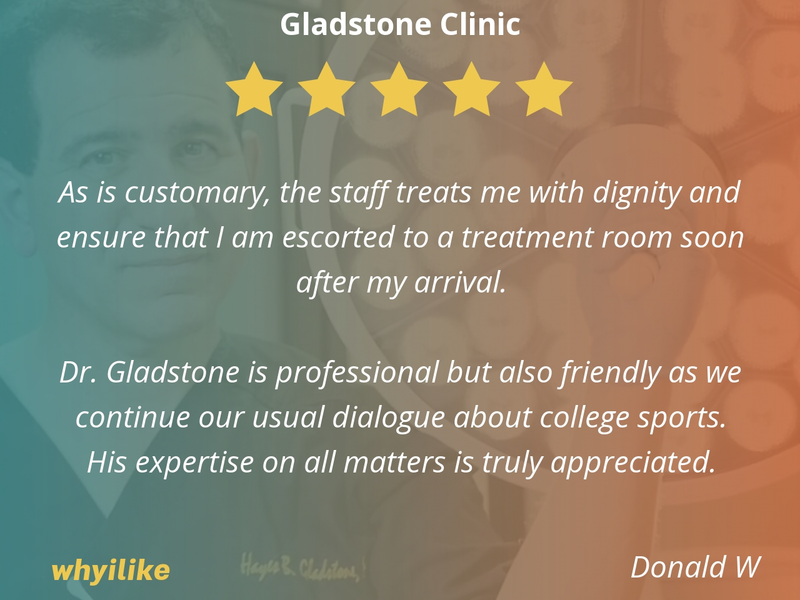 Dr. Gladstone is professional but also friendly as we continue our usual dialogue about college sports. His expertise on all matters is truly appreciated. 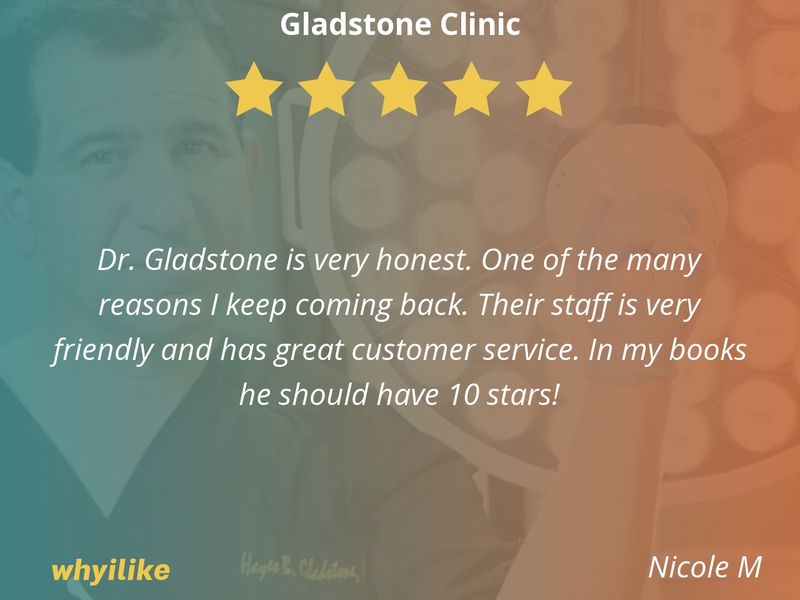 Dr. Gladstone and staff are the best. I was mt with 2 beautiful smiles. The front receptionist was on the phone so I gave her privacy to look around the waiting area. When she finished the phone call I approached the counter and she smiled and said I was all checked in. Very personal service. The waiting room is very clean and currant magazines. 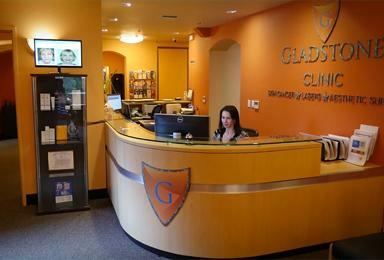 My appointment was on time and Dr. Gladstone greeted me with a smile and handshake. Whenever I come here I am always greeted warmly and promptly. The procedures are done professionally and with great care towards the patient. 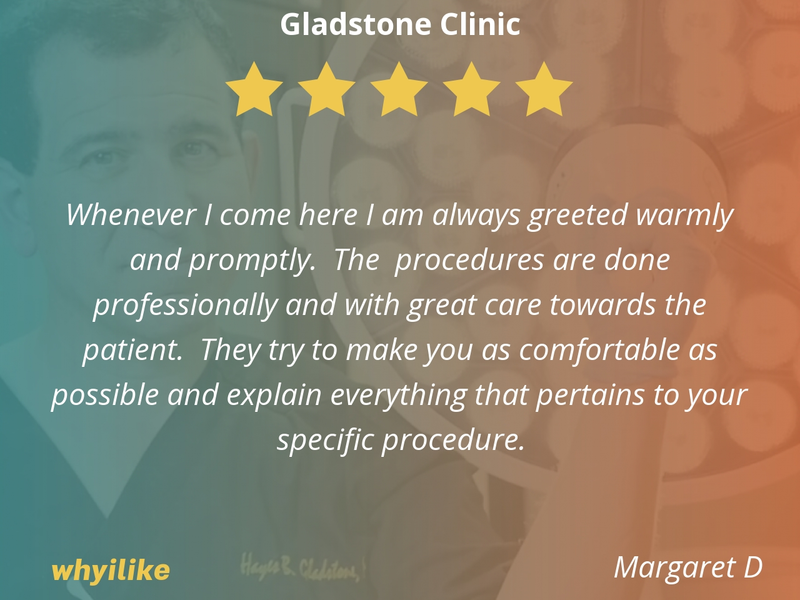 They try to make you as comfortable as possible and explain everything that pertains to your specific procedure. 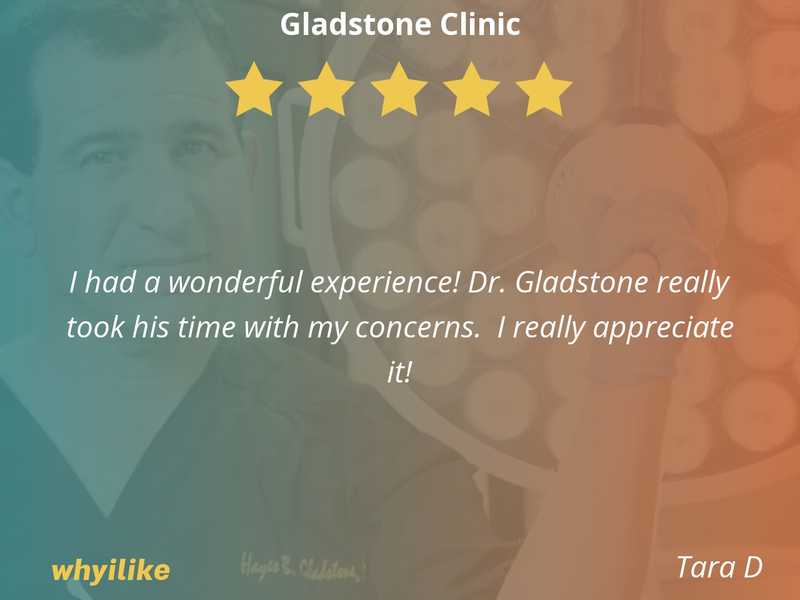 Dr. Gladstone is a real treat. He explains what he is doing during the exams and is glad to any questions. The staff is professional and comfortable. 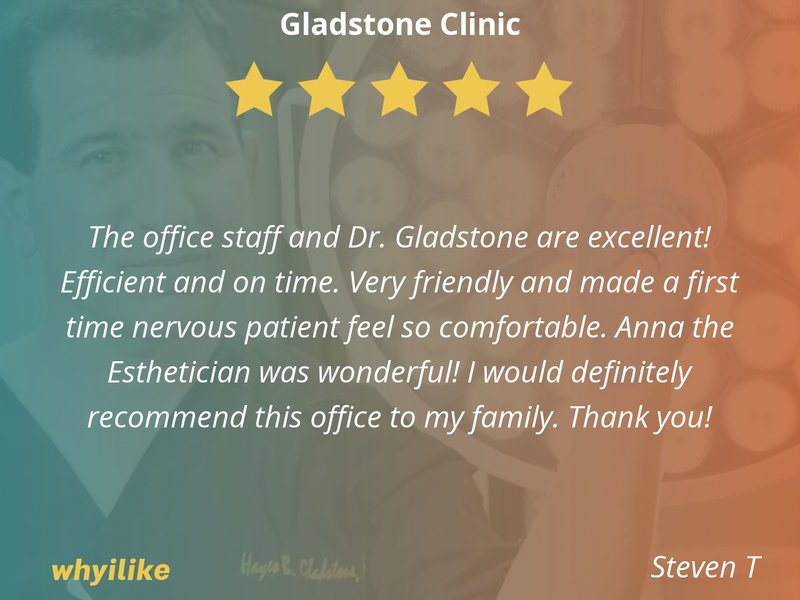 The office staff and Dr. Gladstone are excellent! Efficient and on time. Very friendly and made a first time nervous patient feel so comfortable. Anna the Esthetician was wonderful! I would definitely recommend this office to my family. Thank you! I had a wonderful experience! 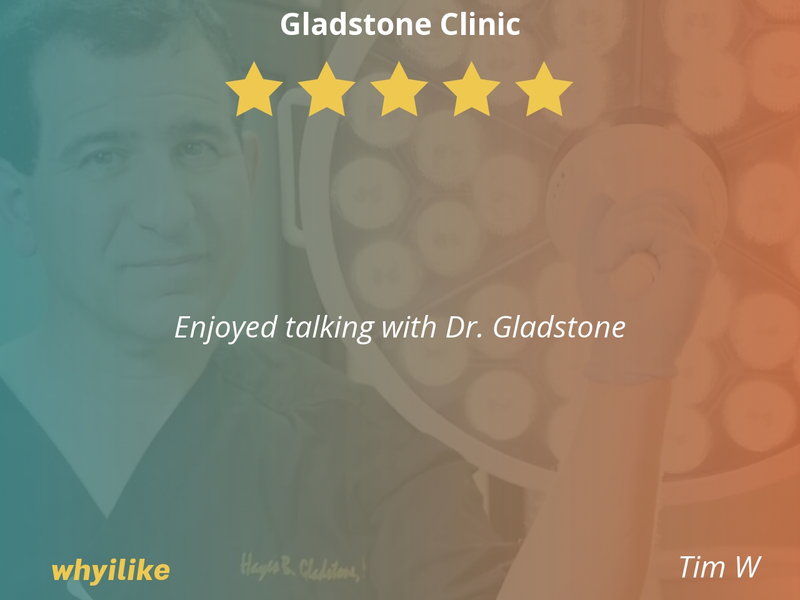 Dr. Gladstone really took his time with my concerns. I really appreciate it! 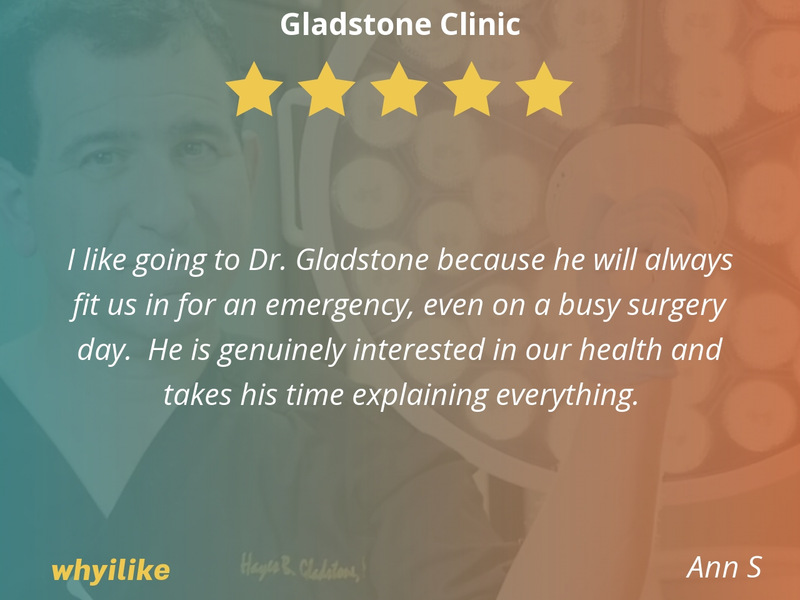 I like going to Dr. Gladstone because he will always fit us in for an emergency, even on a busy surgery day. He is genuinely interested in our health and takes his time explaining everything. 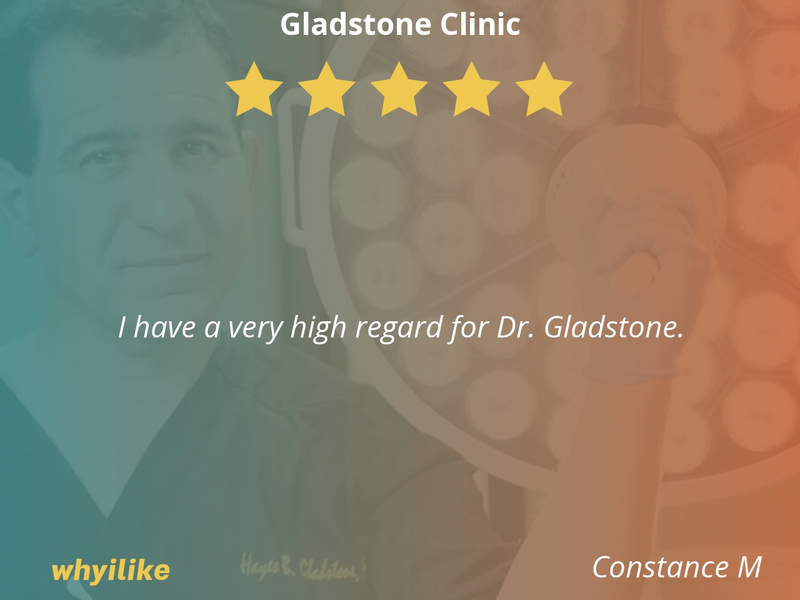 Dr. Gladstone is absolutely professional, knowledgeable, respectful, kind , trustworthy & very caring. 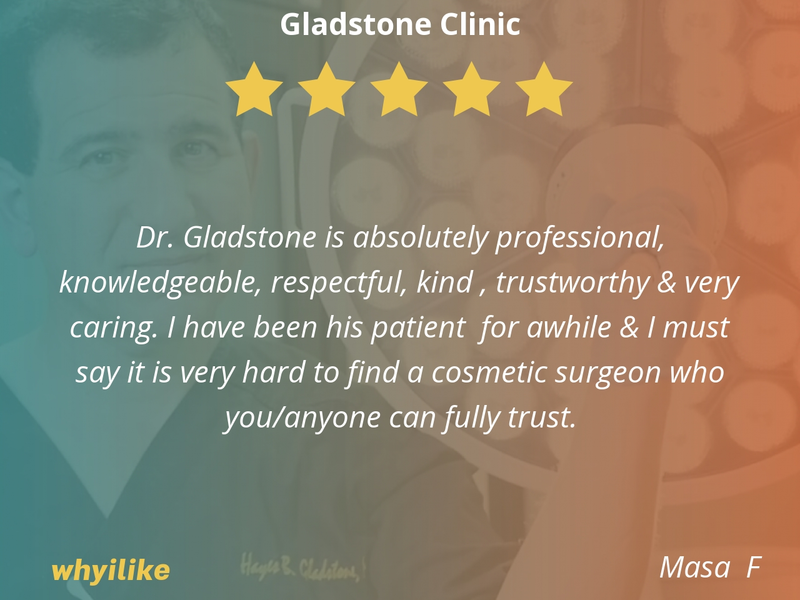 I have been his patient for awhile & I must say it is very hard to find a cosmetic surgeon who you/anyone can fully trust.